Riggs: Do you only play acoustic or do you play electric also? chris: almost like a movable open F I guess...is that right? chris: on the second lick...is that a 22? Deano: man, what a stretch for that last bit. Deano: around 22", I think. chris: towards my body you mean? Deano: Teach... on that G chord stretch to 7, do you have to get that pinky all the way behind that fret, or just close enough to pull the note off? Tom: Thanks for the tip I'll do that..
AppxGuy: Great, except my little finger hurts. 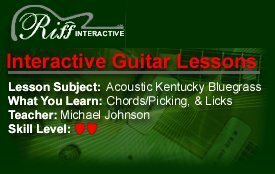 Michael: notice this combines playing licks over each chord, better with a pick for bluegrass, notice in the last sequence of licks how you move with the progression, see you next lesson!